Fears about sea level rises swamping the existing main railway route to the South West mean the old line between Okehampton and Plymouth may be revived. 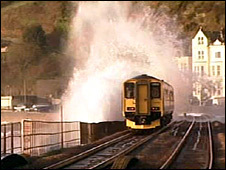 The current line runs along Dawlish seafront and trains can be cancelled and delayed during heavy storms as waves break over the line. Long-term concerns about the line mean that the inland route, closed in the 1960s, may have to be reopened. A report for train operators says it could happen within the next 50 years. Transport consultant Jim Steer, who wrote the report for the Association of Train Operating Companies, said: "I think it's important not to get too romantic about reinstating the railway lines that Dr Beeching closed in the 1960s. "Instead we should looking at the real transport needs and in this case it is a faster route into Cornwall and a route that avoids the risk factor around the coastal route that are the motivations." Developers are already trying to raise £10m to reopen part of the route, from Tavistock to Plymouth. The 5.5 mile (9km) Drake line was closed off at Bere Alston in 1968.